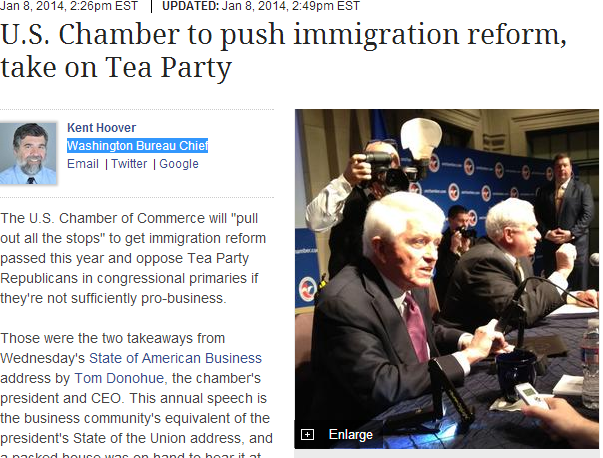 According to Washington Bureau Chief, Kent Hoover and the Tampa Bay Business Journal, The U.S. Chamber of Commerce set to pull out the stops to get immigration reform passed this year. The chamber spends more on lobbying than any other organization in Washington, D.C., but had little to show for its $52 million in 2013. With lobbying support, The chamber is hopeful for immigration reform. Boehner on Wednesday told his Republican colleagues that the immigration reform isn’t going away and the House needs to address it, according to Politico. He reiterated that the House won’t take up the comprehensive immigration reform bill passed by the Senate last year, but instead follow its own path, based on a set of principles that are now under development. Immigration reform is important to businesses not only to make sure they have the workers they need, but also for the “innovation, ideas, investment and dynamism” immigrants have brought to America “throughout our history,” he said. Most observers think the odds remain against comprehensive immigration reform this year, particularly because many House Republicans will balk at giving a pathway to citizenship to the millions of immigrants who are in the U.S. illegally. But that’s one area where the chamber’s election activity, as well as its lobbying, could sway some votes. The chamber spent $36 million on the 2012 elections even though it stayed out of the presidential campaign. It could spend even more on this year’s congressional elections. Most of this money will to go to “protect and expand a pro-business majority in the House and advance our position in the Senate.” If you think that means backing Republicans, you’re right. But the chamber also will get involved in Republican primaries if they think one candidate is more pro-business than another candidate. The reform hold up in 2013 has put a strain on many people seeking citizenship in the United States. Seeking an immigration attorney may be vital for the protection of you and your loved ones. If you are being affected during this reform process and need legal aid contact Blick Law Firm today for a free case evaluation. Think quick, call Blick! This entry was posted in Blog, Immigration and tagged immigration attorney, immigration news, Immigration Reform, immigration Reform Bill, immigration reform update. Bookmark the permalink.